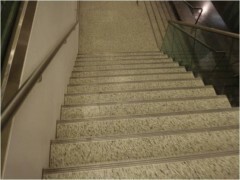 Why luminance contrast on stair nosings? 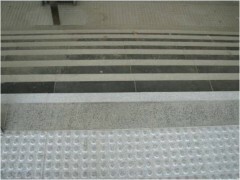 A large proportion of falls on stairs are due to miss steps, particularly when descending stairs. 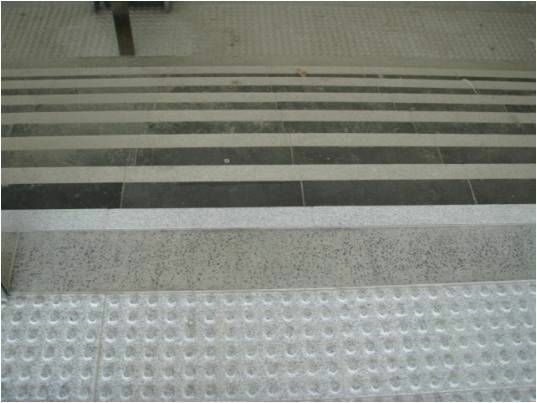 The majority of people when having fell, comment that they slipped, when in fact they have more often placed their foot too far over the edge of the step. It many instances, the risk of miss placing ones foot on the step can be significantly reduced by clearly delineating the step edge. Simply changing the colour near the edge can assist, but it isn’t the best solution for all. Vision impaired persons can more easily differentiate differences in shades of grey which is otherwise referred to as the luminance reflectance. By providing a difference in the luminous reflectance of adjacent surfaces, vision impaired people will have a greater indication of a potential change. 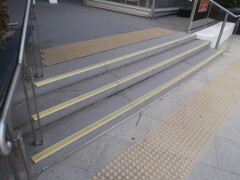 This is significant when there is a hazard such as knowing where the step edge is each time they walk up or down stairs. Luminance contrast is not only for vision impaired persons! Incorporating stair nosings with sufficient luminance contrast is one method to reduce the risk of falling on stairs. Luminance contrast testing can be conducted either in the laboratory for architects, builders and product supplies prior to construction, but also for ongoing auditing appraisals of current buildings under daylight and artificial lighting conditions. Safe Environments provide luminance contrast testing using both laboratory and onsite methods using equipment calibrated by NATA accredited facilities. Our consultants have qualifications in materials science, ergonomics, occupational hygiene and occupational health and safety. We provide luminance contrast testing in Sydney, Melbourne, Brisbane, Canberra, Perth, Adelaide, Hobart and Darwin. Laboratory testing is conducted using a tristulmus colourmeter which pulses a light of specific wavelength(s) simulating natural daylight onto the material using singular point measurements of 8 mm in diameter. A sensor will then detects the light being reflected back and measure the luminance reflectance as a percentage to that of a perfect reflector. 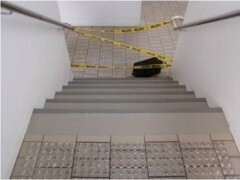 The laboratory method for luminance contrast testing is best to determine luminance contrast prior to the installation of stair nosings. Onsite testing can be conducted using a Photometer or single lens reflex luminance meter to measure the light intensity of the light being reflected back (2 degree angle of incident light). This is conducted with the angle as someone approaching. The onsite method for luminance contrast testing is best to determine the luminance contrast of stair nosings under ambient lighting conditions. By measuring the luminance reflectance of both the tread and the nosing, the luminance contrast can then be calculated by using the formula provided for building elements in AS 1428.1 Design for access and mobility – General requirements for access – New building work. 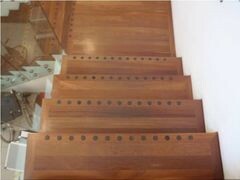 For stairs a minimum of 30% luminance contrast is recommended between the nosings and treads.